I spent a few weeks staying at a friend’s house recently and got to spend my days with a seven year old who sure loves her treats. 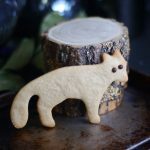 I don’t know if it was her playfulness and imagination rubbing off on me, or the sight of a set of forest animals cookie cutters, but I suddenly found myself baking… and baking… and baking cookies galore! The ginger and cinnamon flavors in these cookies are very mild by the way, so not overpowering, and absolutely lovely with a cup of almond milk. P.S. for a nut-free variation of this kind of cookie, you can try these vanilla bean cut-out cookies instead. 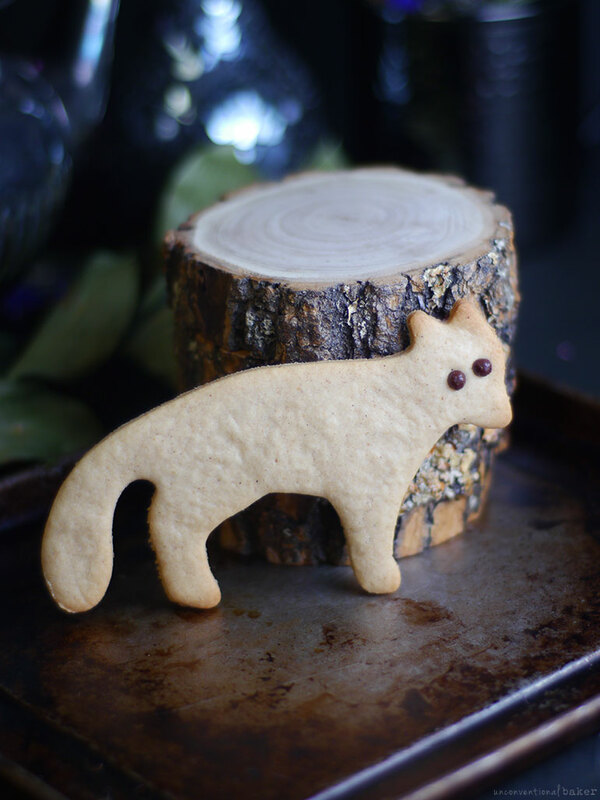 A delicious, mildly sweet spiced gluten-free ginger cookie, using adorable fox cookie cutters. Make them any shape you like! 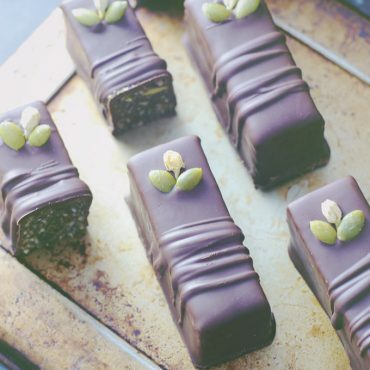 Dairy-free, no refined sugar. Process all ingredients in a food processor until the mixture begins to form a ball (note if the mixture is too sticky, add a bit more flour, if too dry, add a bit more maple syrup). Form the mixture into a ball with your hands and knead briefly, then flatten into a disk. Place the disk between two sheets of parchment paper on a flat surface and use a rolling pin to roll out into an 1/8″ thickness. Use a cookie cutter to cut out as many cookies as you can (I used these) — transfer those onto the prepared cookie sheet (very carefully!). Gather remaining dough scraps, form into a ball, and repeat the process of rolling out and cutting out more cookies until you run out of dough. 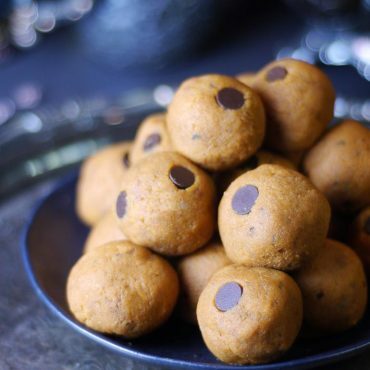 If desired, press in some chocolate balls or cacao nibs into the cookies to create “eyes” (or you can just press in with a blunt object, like chopsticks, to indent some “eyes” instead). Bake in a pre-heated oven for approx 10 mins (or bake longer for crispier cookies to your liking, just watch that they don’t burn — they are ready when they begin to golden around the edges). Remove from oven and allow the cookies to cool a few minutes (they will firm up a bit as they cool off). Enjoy! 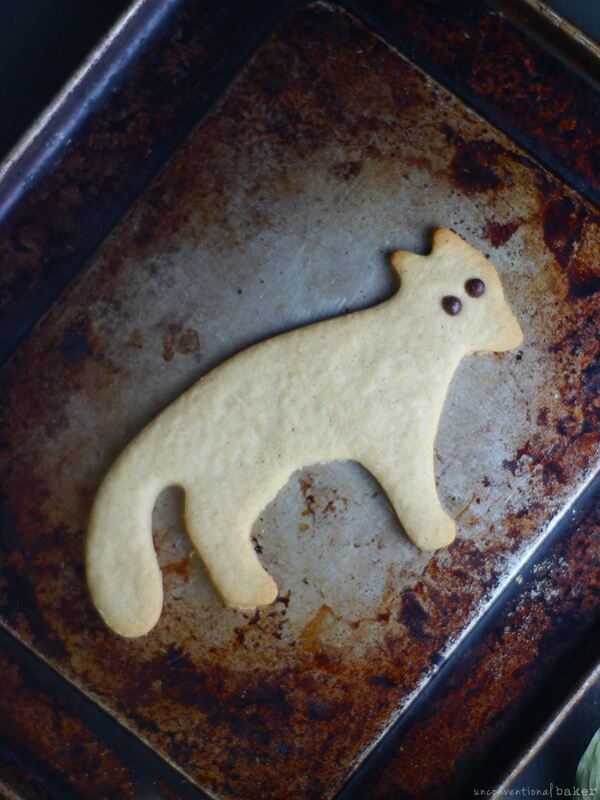 This recipe contains an affiliate link to the cookie cutter set I used. Hi Dana, welcome to the blog! Hey Audrey, thank you for all the wonderful recipes and ideas you share with us. 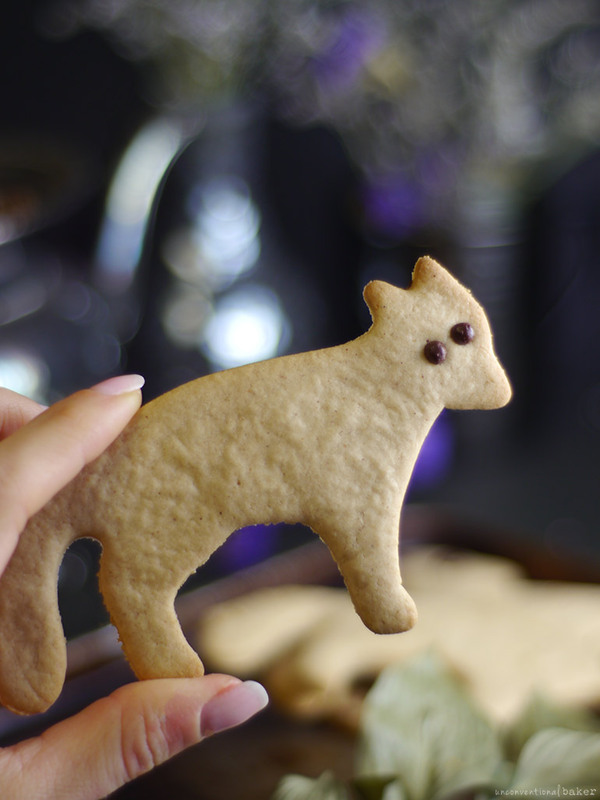 These little foxes were just so adorable, I really had to finally try your cashew tea biscuits.. expect I didn’t have cashew butter to hand, so used almond butter instead. It worked and they are delicious, but I wonder if it changed the texture. I’ll have to give them another try and see. In the meantime, do you have any thoughts on cashew vs almond butter in baking? Hi Camila. So happy you gave these a go, even with almond butter :) And thank you for the lovely feedback. I do find that almond butter vs cashew butter (or other nut butters) are indeed quite different in baked goods. At first I thought they should be quite the same, but experimenting I found actually the results are not alike. Each nut butter brings its own flavor, color, and sometimes texture. Almond butter is stronger in flavor than cashew butter, especially when baked. Cashew butter tends to be quite mellow. Almond butter is “almondy” instead and is not as naturally sweet, and so the flavors tend to need a bit of adjustment. I like to add a bit more sweetness, and sometimes play up the almond flavor with almond extract or some cinnamon, etc. Cashew is lighter in color too, creating a lighter cookie. And lastly, I find almond butter often has specs or grains of almonds in a way that cashew butter doesn’t, which can affect the texture somewhat. Those are so cute, Audrey! I bet my girls would love to make them, can’t wait to show them the result! Thank you! Hehe — hope they like them :) It was fun to play with these cookie shapes. Yes, definitely! :) So much imagination, it’s contagious. I have to share this little gem from this girl — it cracked me up, and it was one of many… We were in a car and I was in the back seat chatting with her on the way somewhere. She had this giant sea shell with her, you know the kind that’s all pearly and patterned on the inside. We got on talking about pearls and muscles and clams, and how the shell is their home, etc. And then she asked me how the patterns is made in the sea shell… before I could even respond, she answered her own question with some serious consideration in her expression: “oh, it must be because the clam didn’t mop the floor very well” — can’t argue with that logic, can you? ? Neither can you argue with animal-shaped cookies under the circumstances, so ginger foxes, and moose, and hedgehogs happened… good times! Hahahahah!!! I love that answer so much–better than anything I (or probably any adult) could’ve come up with?? Aww to think that way again! I know — she totally got me there ? P.S. I can’t stop trying to imagine a little clam somewhere out there trying to mop the floor somehow ?